The figures say it all. Check out the following information regarding the low cost super specialty treatment in India. • Tanzania has for the last three years sent around 200 patients for heart surgeries alone. • Total of around 1.5 million foreigners visited India for various medical treatments. • The total worth of medical tourism industry is around $450 million and is estimated to reach $2.2 billion by the year 2012. • Foreign patients visiting India for various medical procedures last year marked a growth of 15% a year. • The cost of treatment in India starts as low as 1/10th of the total cost in US or UK. • Last year marked an increase in uninsured Americans visiting India for medical treatments. • Over 150000 patients of over 55 countries visited India for various medical tourism services. • The medical tourism industry marked a growth of over 30%. 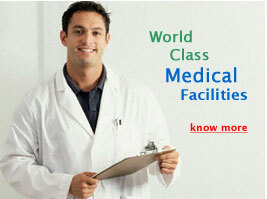 • The medical tourism services in India are rated as the best super-specialty services. • The medical expenses in India are 60 to 80% cheaper in India as compared to US or UK.